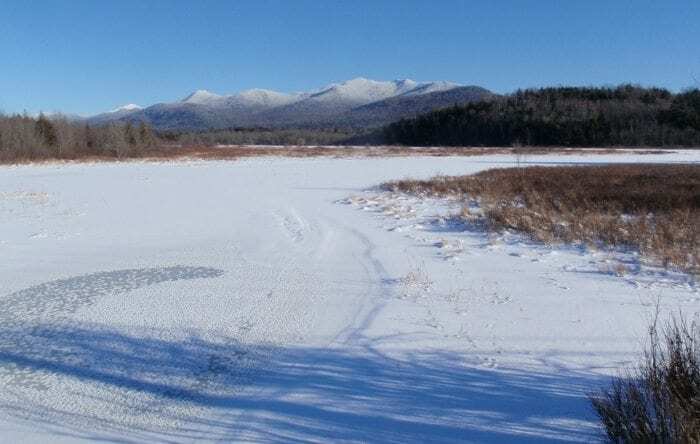 Whiteface Mountain (in distance) and Moose Mountain as seen from Moose Pond. Photo by Phil Brown. Another cold but brilliant day in Saranac Lake. 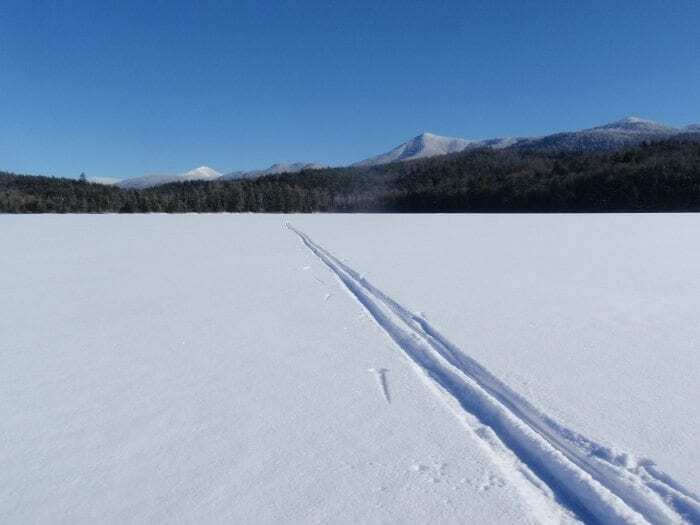 I skied to Moose Pond on my lunch hour, a pristine water body with knockout views of Moose Mountain and Whiteface Mountain. 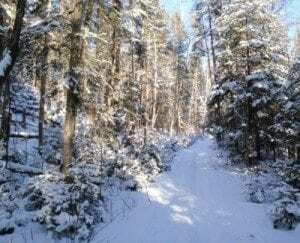 As usual this winter, I was worried about the amount of snow cover and so was glad to discover that the trail has been skied a lot in recent days. There were well-packed ski tracks all the way to the pond. 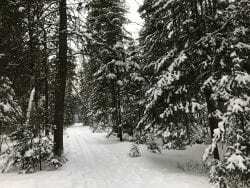 Snowshoers also have been using the trail. I want to thank them for hiking to the side of the ski tracks. The Moose Pond trail is an old woods road that doesn’t need a lot of snow to be skiable. For most part the cover was adequate, but it was thin in spots, with occasional roots and rocks sticking out. Also, there was a section of glare ice just before the first turnoff to the pond. It’s only about a mile and half to Moose Pond, but you can extend the trip by skiing on the pond. In fact, this is the highlight of the trip, in my book. The views from the pond of frosty peaks are stunning, especially on a sunny afternoon. And the ski conditions on the pond are ideal right now. The trailhead for Moose Pond is a few miles north of Saranac Lake on Route 3. 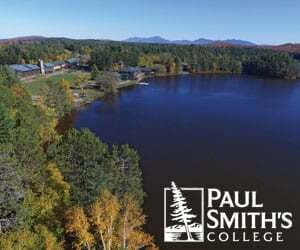 You begin by skiing down a dirt road between two fields to a green steel bridge over the Saranac River. After crossing the river, follow the old woods road 1.4 miles to an unmarked junction. Most skiers bear right to descend to the pond. I usually continue 150 yards and take a right at a second junction. 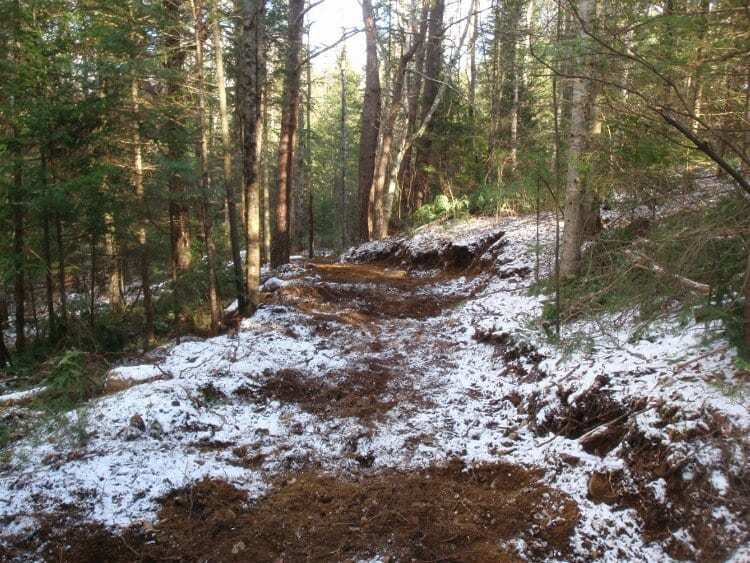 This leads to an outcrop of bedrock that affords easy access to the pond. 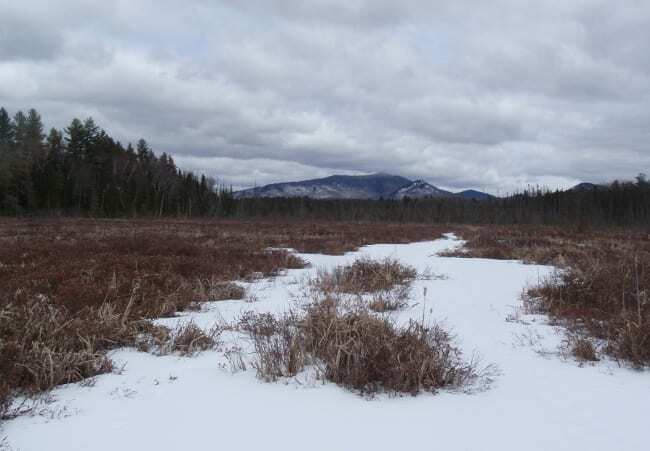 Moose Pond is in Tony Goodwin’s Ski and Snowshoe Trails in the Adirondacks. He rates it as suitable for beginners. The McKenzie Range as seen from Route 3.